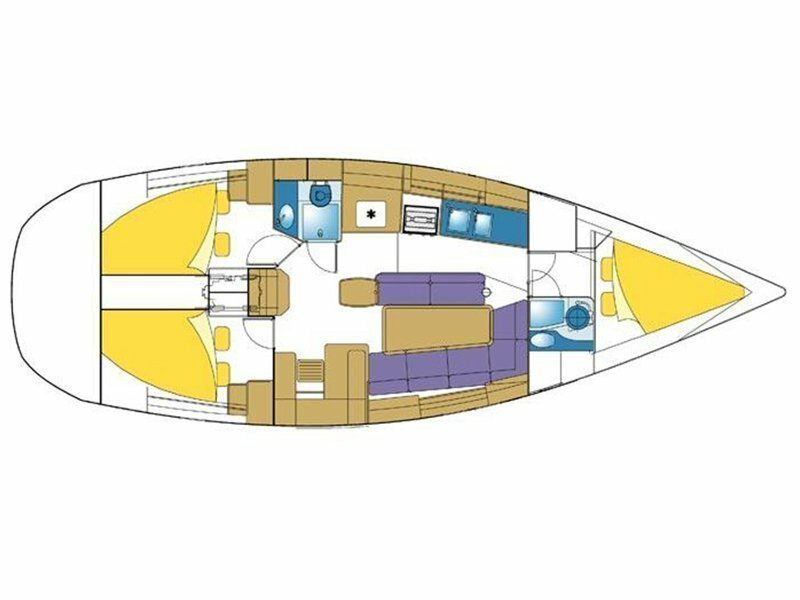 On top of her elegant and slim shape, the Feeling 39 offers an incredible living space. 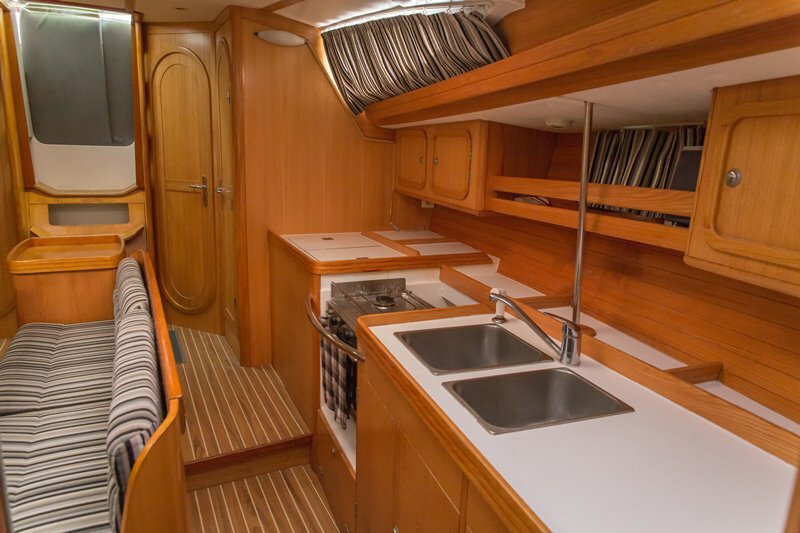 The saloon in maple wood is light with large deck and lateral roof windows, equipped with curtains. 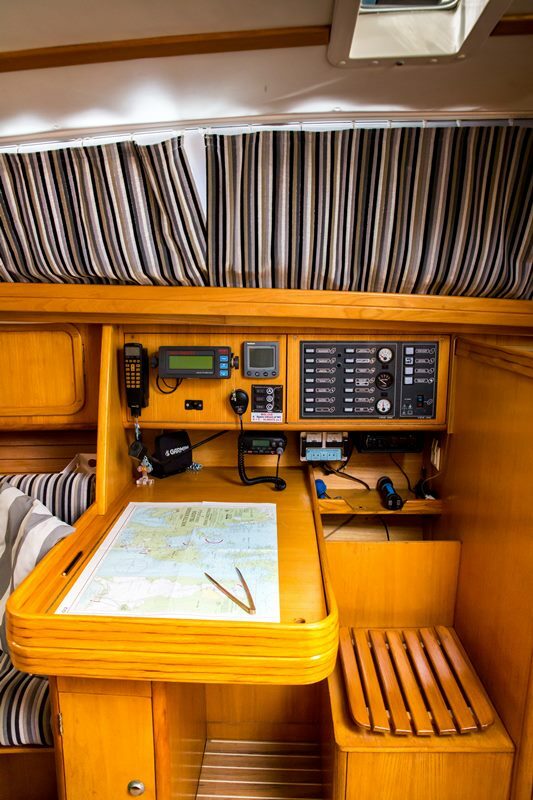 The forward facing chart table on starboard is ergonomic thanks to the curve seat and storage for wet clothes and companionway washboards. There are many storages also under the floor and settee. 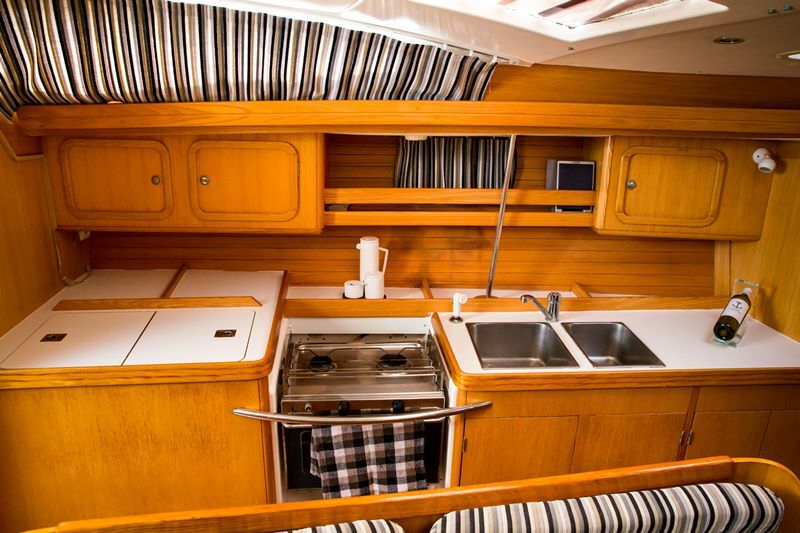 The friendly and functional galley is ventilated with opening hatch on the roof. 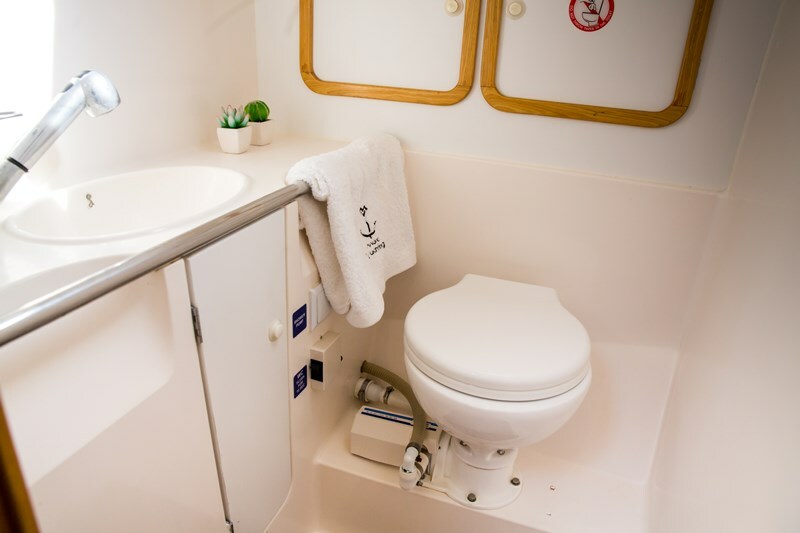 The cabins are comfortable and provide an easy technical access. The hull and the deck are moulded, each as one piece in GRP. The deck is glued and screwed to the hull. The screws are overlaminated from the interior in order to ensure a perfect leaktightness. 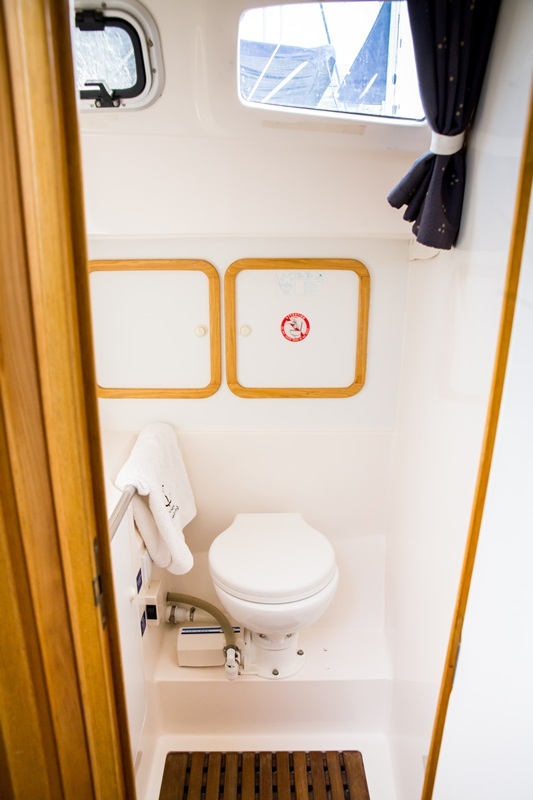 At the bow, a crashbox is integrated as a safety point. 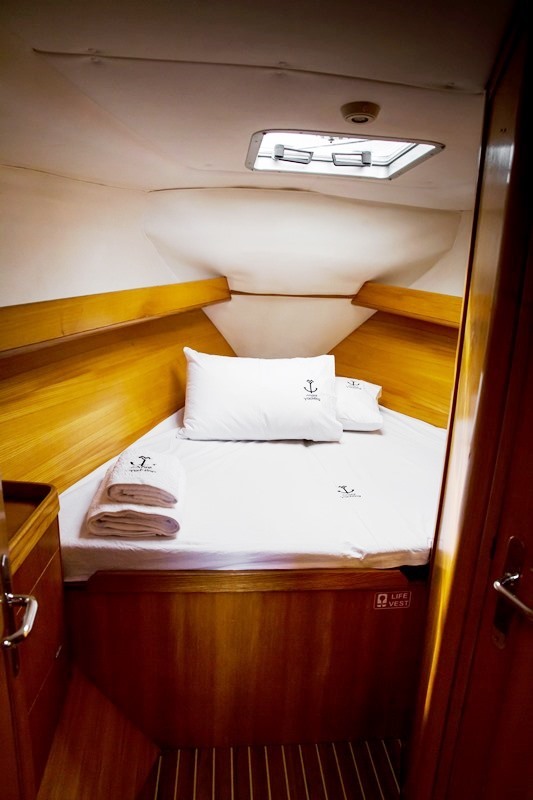 Bottoms are reinforced with laminated wood floor timbers in order to take the strength of the mast and chain plates. 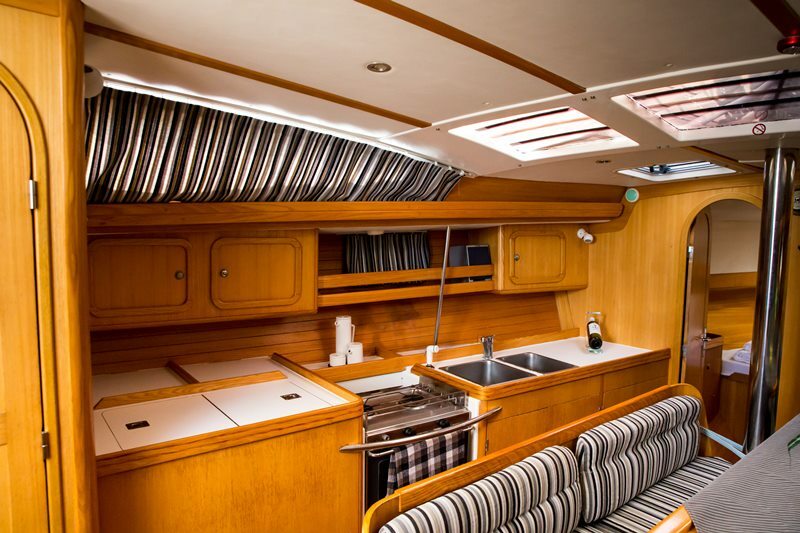 Like the bulkheads, the carpentries are directly laminated to the hull and deck for a better rigidity. Ending Time 1. The Owner agrees to let on bare-boat charter and the Charterer agrees to charter the unattended above mentioned yacht (hereinafter called "the Yacht") for the period as stated above and commencing at (Saturday) , 17:00’ o´clock on the stated starting day and ending at (Saturday) , 09:00’ o´clock on the stated ending day for the sum as stated, of which 0,00 € are due and payable by the charterer upon the signing of this Agreement. Payment When no payment is received within 15 days from booking confirmation, charter will be consider cancelled without further notice . The balance of 0,00€ is due and payable in the following manner: 4 weeks before the embarkation. 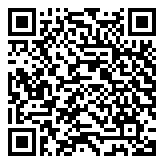 Validity 2. The signature of this Agreement by the Owner and/or his Agents becomes valid and binds the Owner to his obligations hereinafter mentioned only on condition that the Owner will actually receive the sums of the payments as indicated in Clause 1 above, in time. Insurance b. To insure the Yacht and her equipment against fire, marine and collision risks and third party damage and against any and all loss or damage in excess of € 0,00 and the Charterer shall therefore be relieved of any and all liability which is covered by the said Policy, provided that such loss or damage is not caused or contributed to by any act of gross negligence or willful default on his part. Should the Owner fail or elect not to effect such insurance he shall assume the same responsibilities as if the Yacht were so insured, but he shall not be under any liability for the loss or damage to the personal property of or for any injury to the Charterer or any person on board with his permission. Excess Delay III. If the delay of delivery exceeds one fourth (1/4) of the total charter time, to cancel this Agreement and be refunded by the Owner with the total amount paid for this charter. In any of the events mentioned in this Clause, neither party shall be liable to pay to the other any other compensation for any loss or damage resulting from the curtailment or the cancellation of this Agreement. a. To redeliver the Yacht to the Owner at_ PORT cleaned-up, together with all her equipment, in the same good condition as she was at take-over, at the time designated in Clause 1, but, unless the Yacht has become a total loss, if he shall for any reason fail to deliver the Yacht at the aforesaid date and time, to pay to the Owner demurrage at the rate of the charter price per day of this Agreement increased by fifty percent (50%), for every day or fractional part of a day there-after until delivery has been effected. 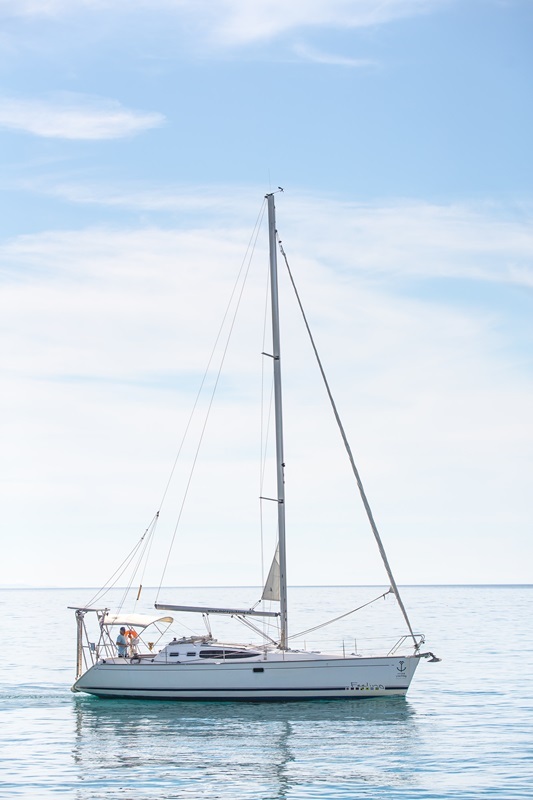 If he leaves the Yacht at any place other than the place designated in this Clause, to pay to the Owner all expenses involved in transferring the Yacht to the place of redelivery and pro-rata demurrage as above for the number of days required for this transfer, as well as for any loss or damage not covered by the insurance policy, which may occur on or to the Yacht until she has been taken over again by the Owner. Guaranty b. To leave on deposit and as guaranty with the Owner on taking over the Yacht the amount of__€ 0,00 to meet in whole or in part any claim by the Owner in respect of any loss or damage to the Yacht and / or her equipment not recoverable under the policy of insurance as in Clause 3(b) hereof and for any claim by the Owner in respect of the provisions of Clause 4(a) above. 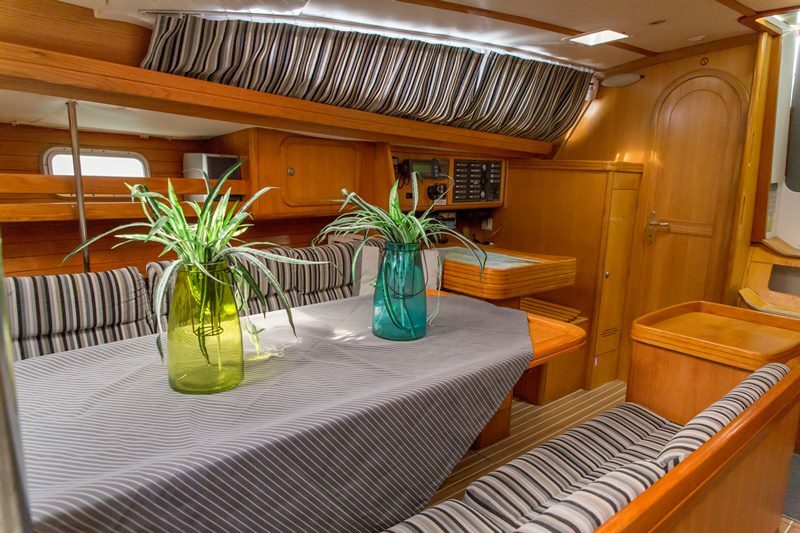 use of the Yacht The aforesaid deposit shall be refunded to the Charterer, subject to the provisions above, after inspection of the Yacht, her gear and her inventory by the Owner. and Cruise Limits c. Not to use the Yacht for racing or for towing other craft, except in an emergency, or generally for any purpose other than that of private pleasure of the Charterer and his party which should include not less than ONE (1) qualified skipper and ONE (1) experienced crew members, but not more than_(depending of the boat) in all at sea, or to accommodate aboard any person other than those shown on the crew/passenger manifest nor to take the Yacht or permit her to be taken outside the area of the Greek seas nor to sublet the Yacht without the written consent of the owner. and Diving Laws d. Not to allow any person on board to commit any act contrary to the custom laws of Greece or of any country or contrary to the laws pertaining to fishing or under water fishing nor to seek and/or take possession of objects of archaeological nature or value and that in case any such act is committed this Agreement shall thereupon terminate, but without prejudice to any rights of the Owner and that the Charterer shall carry alone any resulting responsibilities and he shall answer alone to the appropriate Authorities. Yacht e. To take every possible preventive measure and precaution to avoid to bring the Yacht in any condition in which the Yacht will need to be towed to any point by another vessel, but should such a necessity arise, in-spite of the Charterer´s efforts, to negotiate and agree with the captain of the other vessel on the price to be paid, before allowing the Yacht to be towed. Leaving Port f. Not to leave a port or anchorage if the wind force is or is predicted to be over six (6) of the Beaufort Scale or if the harbor Authorities have imposed a prohibition of sailing or while the Yacht has unprepared damage or any of her vital parts such as engine, sails, rig, bilge pump, anchoring gear, navigation lights, compass, safety equipment, etc. 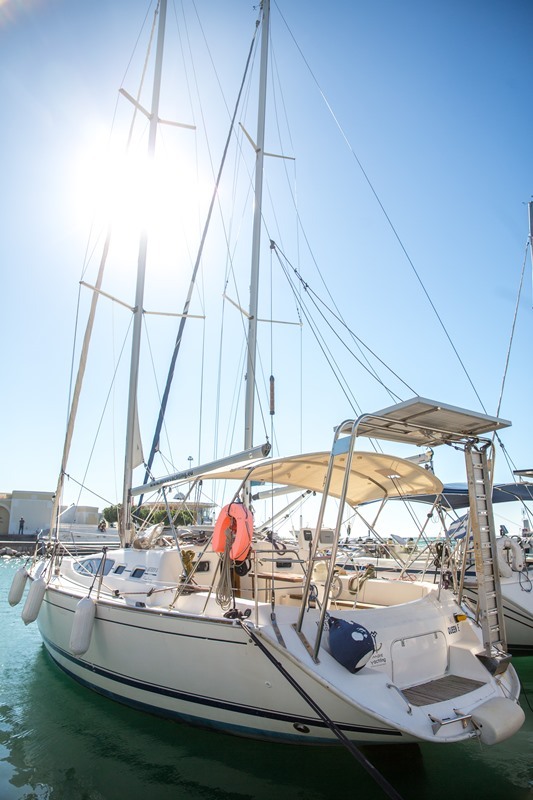 are not in good working condition or without sufficient reserves of fuel or in general, when weather conditions or the state of the Yacht or its crew or a combination of them concerning the safety of the Yacht and her crew is doubtful. Navigation g. When necessary, to promptly reduce canvas and not to allow the Yacht to be found sailing under an amount of canvas greater than the one insuring comfortable sailing without excessive strains and stresses on the rigging and the sails, not to sail the Yacht in any area not sufficiently covered by the charts at his disposal or without having previously studied the charts of the area and other printed aids on board thoroughly, not to sail the Yacht at night without all navigation lights functioning or without sufficient watch on deck. 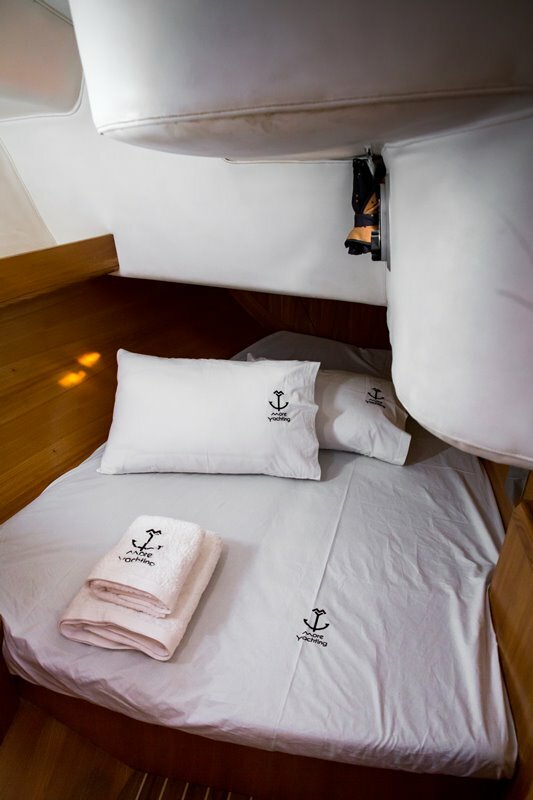 Yacht Log h. To keep the Yacht´s Log Book up to date, noting each day the port of call, the state of the Yacht and its equipment, any change in the composition of the crew when at sea, regularly, the times positions, weather conditions, sail plan and hours of engine operation. Itinerary i. To plan and to carry out the Yacht´s itinerary in such a manner as to reach the port of call farthest away from the point at which the Yacht must be returned to the Owner (Turn-Around Point) within the first one third (1/3) of the charter period and that two days prior to the termination of the charter the Yacht´s port of call shall lie at a distance not greater than forty (40) N.M. from the point at which the Yacht is to be returned to the Owner. 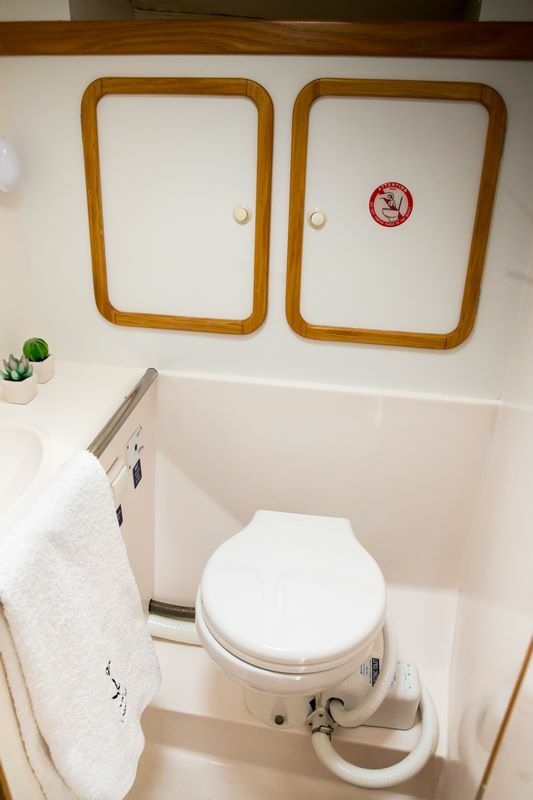 and State k. To report by telephone or cable to the Owner at reasonable intervals (every 3 days) the position and state of the Yacht and of her passengers, as well as in the event of any damage to the Yacht. 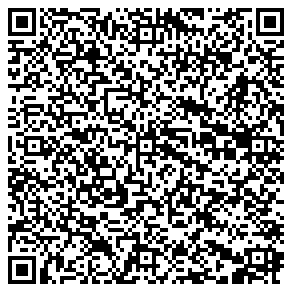 Information l. To study and acquire a working knowledge of any printed matter pertaining to the proper handling of the Yacht and to the conditions in the cruising area which may be made available to him by the Owner. Qualifications 5. This agreement is entered into on this basis of the Charterer´s competence in sailing, seamanship and navigation stated by him in writing and in the event of any error, omission or mis-interpretation in this respect being subsequently discovered, the Owner shall be entitled to terminate this Agreement forthwith and to retain the Charter fees. and his Crew 6. The Owner (or his representatives) may require the Charterer and his crew to demonstrate their competence in handling and navigating the Yacht safely by actually operating the Yacht at sea with the Owner (or his representative) aboard and should the Charterer and/or his crew fail to satisfy the Owner in this respect, the Owner may terminate this Agreement as stated in Clause 5 above or place aboard the Yacht a seaman, if one acceptable by both the Owner and the Charterer, is available, at the expense of the Charterer, for as many days as the Owner will consider necessary for the safety of the Yacht and her passengers and any time required for this test of the Charterer´s competence and seamanship will be part of the agreed Charter period. required for it 7. 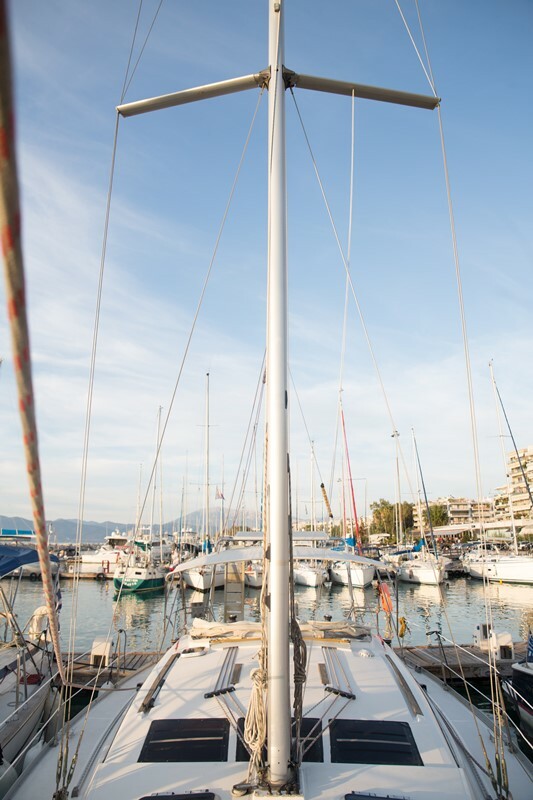 The delivery of the Yacht to the Charterer will be made at the commencement of the charter period as designated in Clause 1. The time required to demonstrate the Yacht to the Charterer and to familiarize him with her shall be part of the agreed charter time. 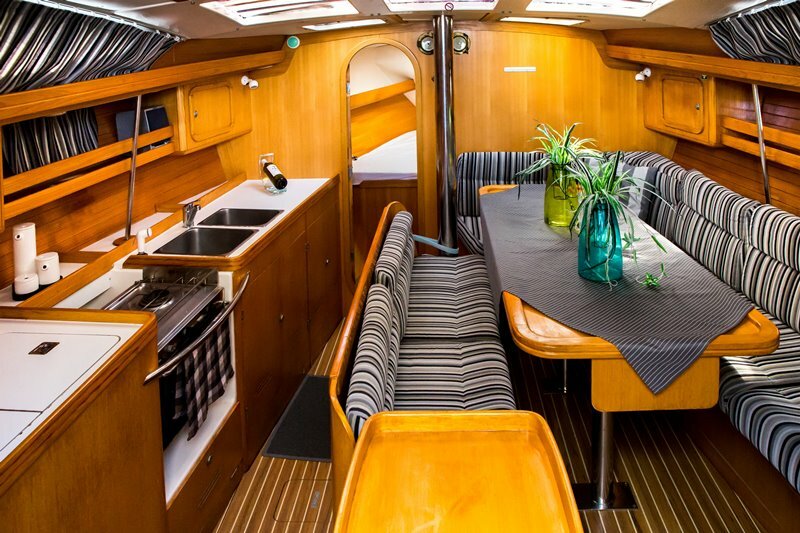 The free use of the Yacht will be granted to the Charterer after he has signed the Take-Over form. during Charter Time 8. Before signing the aforesaid form, the Charterer shall have the right to inspect the Yacht, her gear and her inventory thoroughly to ascertain that all are available and in good working condition, except as may be noted thereon, but the signature of the Take-Over form by the Charterer shall be deemed to imply acceptance of the Yacht which thereafter will be in the Charterer´s full responsibility and the Charterer shall have no right to claim for any loss of time or expense occasioned by any accident or breakdown or failure of any part of the Yacht. Expenses 9. After take-over, expenditures for port-dues, water, fuels, oils and any other stores required, as well as the repair of any damage or failure that may occur while the Yacht is in the Charterer´s responsibility and which are not the result of normal and natural wear shall be made by the Charterer at his expense, provided that he previously obtained the consent of the Owner for the technical suitability of the repair to be made. Damages In the case of repairs of damages or failures resulting clearly from normal and natural wear, the Charterer shall previously obtain the Owner´s consent with regard to the cost and technical suitability of these repairs and the Charterer shall collect the pertinent receipts against which he shall be refunded by the Owner at the end of the charter. of Damages 10. If any accident or damage is caused by the Yacht, the Charterer shall request from the nearest Port Authority to ascertain the damage or accident and the circumstances in which it has been caused and to make a written record and statement about it and he shall notify the Owner at the same time. Termination 11. 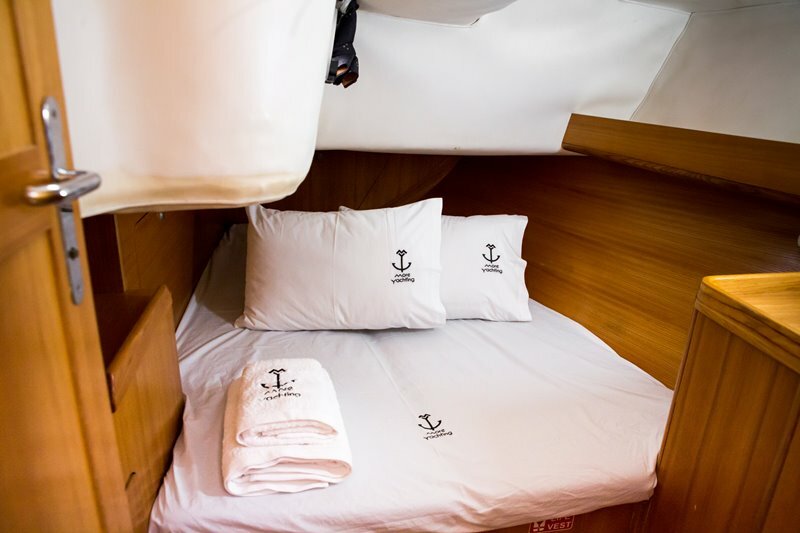 In the event of cancellation of the charter by the Charterer, for any reason, except as mentioned in Clause 3 (c) (III), after signing this Agreement, cancellation more than 90 days before embarkation, cancellation fee 30% is retained. Cancellation between 90 to 31 days before embarkation first payment 50% is retained. Cancellation less than 30 days before embarkation full payment 100% is retained. 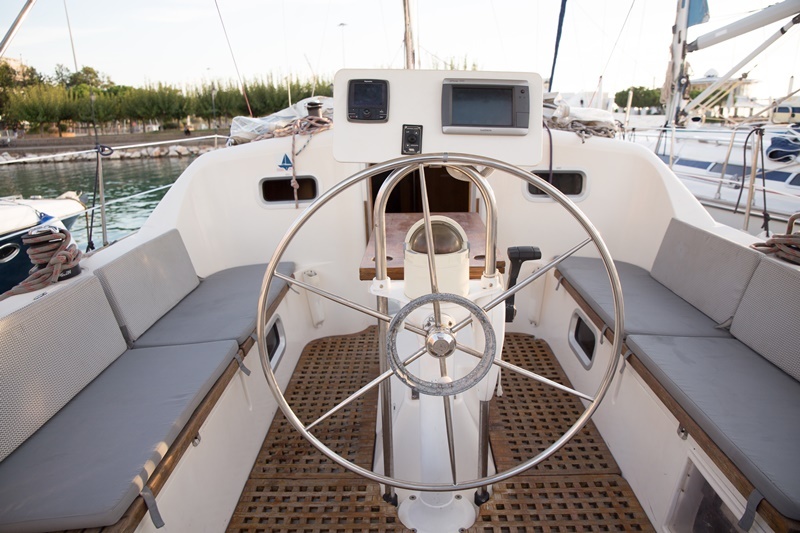 In the event that the Charterer should elect to terminate the charter and deliver the Yacht prior to the date designated in this Agreement, the Owner shall not be liable to the return of any proportional part of the hire money. 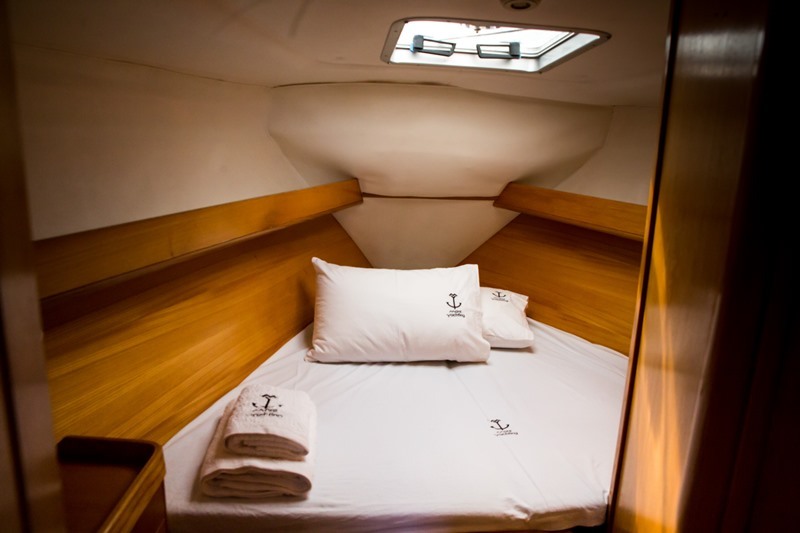 of Yacht 12. Should the Yacht become an actual or constructive total loss before or during the charter period, this Agreement shall be deemed to be at an end and the Charterer shall recover from the Owner all charter money paid in advance to the Owner only in case the loss has occurred before the charter period, or during the charter period, provided that the Charterer or his crew were not responsible for the loss. Provisions 13. The special provisions if any, set out in the Schedule hereto are fully accepted and form part of this Agreement. Agents 14. The Agents of the Owners, _______act in good faith on behalf of both Owner and Charterer but contract as Agents only and in no way incur any liability for any acts, matters or things done, committed, omitted or suffered by either party, except for the responsibilities provided by the pertinent legislation of Greece. of Disputes 15. In the event of any dispute arising between the parties hereto with respect to this Agreement or anything herein contained the same shall be referred to two Arbitrators in Greece one to be appointed by each party, whose decision shall be final or to an Umpire to be appointed by such Arbitrators, if and when they shall disagree, the decision in such event of the Umpire to be final. In the event of trial, authorized courts are the court of Patras, Greece. Conditions Diesel, provisioning, harbor/marina fees during the cruise, water consumption, any other miscellaneous expenses at charterers cost. 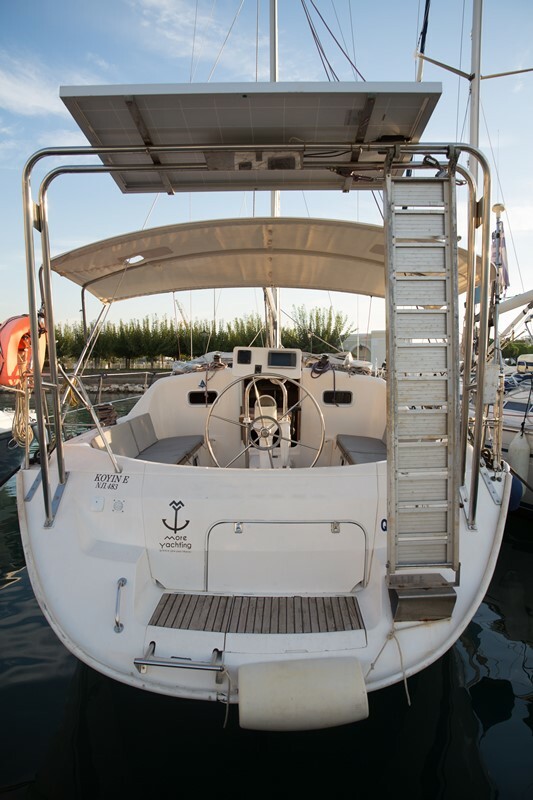 (if any) € 80-120, 00 end cleaning (depending the boat size), are payable at the base in cash.